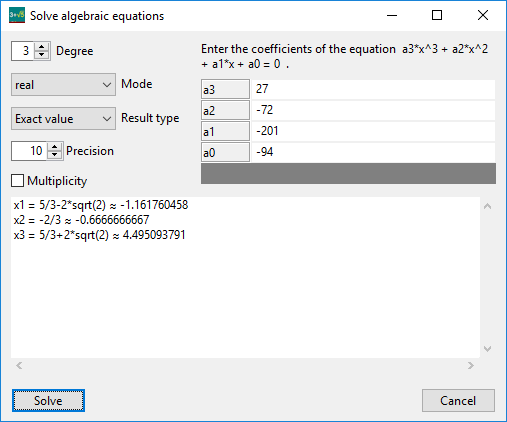 The equation solver can solve algebraic equations an*xn + an-1*xn-1 + ... + a1*x + a0 = 0 with high precision. The coefficients are defined in a data grid. Calculation of solutions of equations from 1st to 10th degree. The precision which is used for calculating the solutions of an equation is adjustable. For example up to 2000 decimal digits are possible for equations up to 4th degree. For quadratic equations exact solutions can be displayed as a mathematical formula. For cubic equations and equations of higher degree exact solutions are possible if rational solutions exist. Complex coefficients and complex solutions are possible.